You’ve finally done it! You’ve graduated from Starfleet Academy and you’ve drawn your dream assignment--the one you’ve always hoped for--aboard the Starship Enterprise! You’ll get to work under the legendary Captain Picard and have amazing adventures all across the galaxy. Just make sure to follow your skills into engineering, or security, or medical, and make all your dreams come true! Whether you idolize Commanders Work, Data, or Geordi LaForge, this outfit will help you fit right in with the rest of the Enterprise crew. 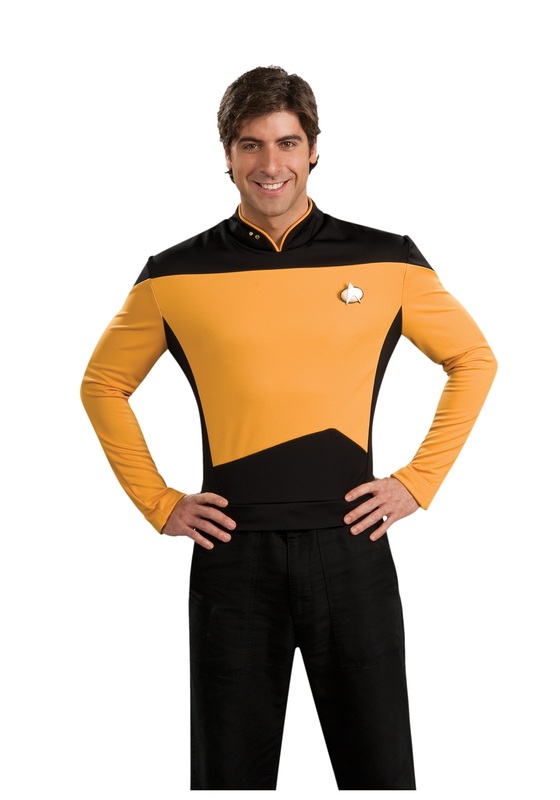 When you don this Star Trek: TNG Adult Deluxe Operations Uniform, you’ll feel the honor and history of boldly trekking where few others have gone, making contact with new and interesting alien cultures, and wildly ignoring the Prime Directive -- despite Picard’s best attempts not to. Just don’t volunteer for the most dangerous assignments, you don’t want to turn yourself into a red shirt. Oh and also, our best advice --grow a beard. Trust us on this one--or look it up--even LaForge will tell you it’s the way to go. Whatever you decide to do aboard your new assignment, just know that you’ll look sharp in this officially licensed costume top, complete with a communicator badge and five butterfly clasp collar insignia pins. Display your appropriate rank as you continue to rise in power. Accessorize this top with a black pair of pants and you’ll be all set to climb aboard. Now get out there and make sure to write home about all those adventures.